Remington had trouble getting up the stairs when he got older. Wasn't Remington handsome? He is about 9 years old in this photo. 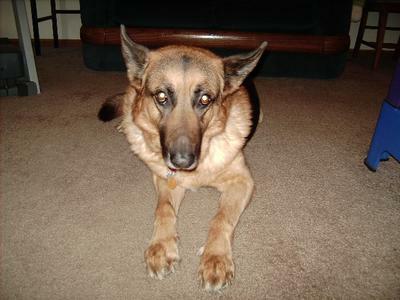 Today is the 1-year anniversary of our previous German Shepherd, Remington, passing away. He was born on July 4, 2002, so he shared his birthday with our great country. My Mom wanted to name him something patriotic, but since all the names we could think of sounded too feminine, we ended up giving him the name Remington's Independence, with Remi for short. 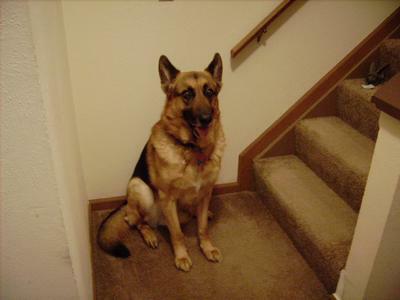 He was a great dog, always patient and loving like a GSD should be. At the time of Remington's adoption, we had a senior Australian Shepherd mix, Tash, who was his buddy for three years until Tash's hind legs gave out, and later on we put him down. We then adopted a Border Collie, Luke, who became Remington's new buddy. A couple years after we got Luke, our cat, KitKat, entered into our lives, and Remington was always nice to her. Due to us moving to an apartment, Luke now lives with my father, and Remington spent the last year of his life with KitKat for his friend. They would lie on the sofa together, and she would lick his ears occasionally. Remington was always pretty healthy, save for some allergy issues and obsessive licking. But during the last few months of his life, Remington wasn't eating as much, and was throwing up bile a lot. One day, when Mom went to take him out for his morning walk, he couldn't get up. Like Tash, his hind legs wouldn't work anymore. Mom and I took care of him for a few days, but it was obvious he was in pain. Remington went over the Rainbow Bridge on November 22, 2011; ironically, a patriotic pup passed away on the anniversary of President John F. Kennedy's assassination. Remington was the best dog you could ask for: patient, smart, loving, protective. I was little when we got him, and he close to me, never letting me out of his sight. He was also there for Mom during the tough times, and was nice to everyone he met. We have a new dog, Olivia, whom I've posted about, and while we love her, Remington will always have a special place in our hearts. We love you, Remington, and we miss you! Sorry for your Loss. I too know that pain so well. You loved your Remi and he knew that. He had a loving home. He will always be in your hearts forever!